The following commercial and restaurant kitchen post was provided by The Range Hood Store on the various aspects of range hoods and Commercial Kitchen Hoods. Kitchens collect grease and grime even with a minimum of use. The reason is simple: vapors from cooked foods have a heavier molecular weight than ambient air. A range hood captures these heavy cooking vapors and keeps the kitchen clean and there’s less build-up of grease and grime on other kitchen appliances and surfaces. Today’s range hoods are built for regular use with most any type of kitchen range. There’s another very important reason to install a range hood in the kitchen: to keep oil and grease vapors from becoming hazardous. Frying oils are the biggest culprits in grease build-up. This is true even when the amount of oils is kept to a minimum. Greasy range surfaces can be the cause of kitchen fires. When oily vapors rise, the range hood processes them into clean, safe particulate that makes the kitchen environment healthier. Keeping the temperature of air in and around the kitchen range also assures accurate cooking and baking temperatures. Commercial kitchens rely on efficient air processing with large range hoods for this reason. In addition, tempered air helps keep temperatures comfortable for professional cooks and bakers. Depending on the amount of use, the size of a range hood plays an important role in its overall efficiency. Today’s range hoods are available in a wide range of sizes. One other important point to be aware of before purchasing a range hood is the motor’s power. There are variables in motor horsepower for different range hood sizes. 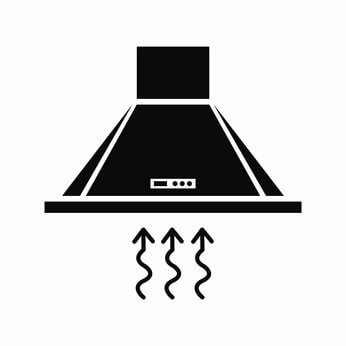 A range hood basically operates with an induced draft fan that takes air into the hood and then releases it through the duct-work attached to the range hood. Today’s range hoods, however, have many hi-tech advantages like filtration units built into the hood chamber. These filtration units make the job of cleaning and maintaining a range hood much easier than in earlier versions. For those in the commercial cooking or baking industries, it’s a simple matter of changing a filter. Some of these are HEPA filters. HEPA filters are an industry standard used in mechanical operations where clean air is a necessity. HEPA filters are constructed from custom materials that offer higher levels of efficiency and less maintenance. Regular maintenance of a range hood is important to avoid mechanical failures that occur from heavy build-up of soil and grease on mechanical parts. As build-up occurs, the motor works harder and eventually the build-up clogs the entire unit rendering it inoperable. Fortunately, today’s range hoods require a minimum of maintenance and are built to last. In many areas, commercial kitchens are required to follow compliance regulations regarding emissions released into outdoor air from ductwork attached to operating range hoods. Usually, regulatory compliance focuses on the volume of air being released into the atmosphere by commercial range hoods. Check with local, county and federal regulatory agencies on compliance requirements that apply. The Range Hood Store is a leader in kitchen appliances and offers a wide variety of stainless steel range hoods. Founded on superior products and even better customer service The Range Hood Store has years of experience helping customers build their dream kitchens.